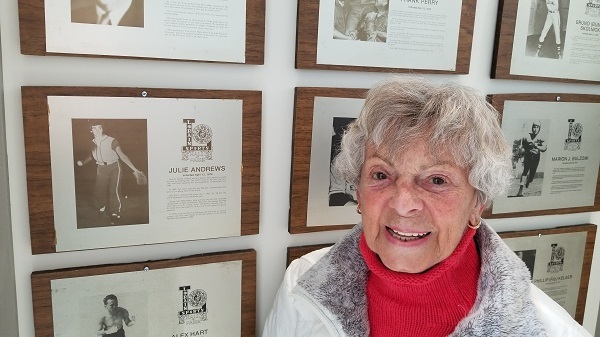 A recent Open House at the Lorain Sports Hall of Fame Museum at Lorain High School drew visitors, including this Lorain softball legend, Julie Andrews, who was enshrined in 1976. Julie Andrews, a 1976 Lorain Sports Hall of Fame inductee and softball legend, is seen with her plaque in the LSHOF Museum at Lorain High School at the April 10, 2018, museum Open House. Here’s a link to her page in the Past Inductees section of our website. Great news for Lorain, indeed! We salute the Lorain High Titans for putting the boys basketball team in Ohio’s Final Four for the first time. The Titans’ 22-6 season ended today with a hard-fought 51-44 loss to No. 2 Cincinnati Archbishop Moeller (26-3). Next season can’t get here soon enough. Go Titans! 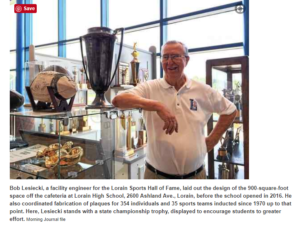 A big thank-you from LSHOF! 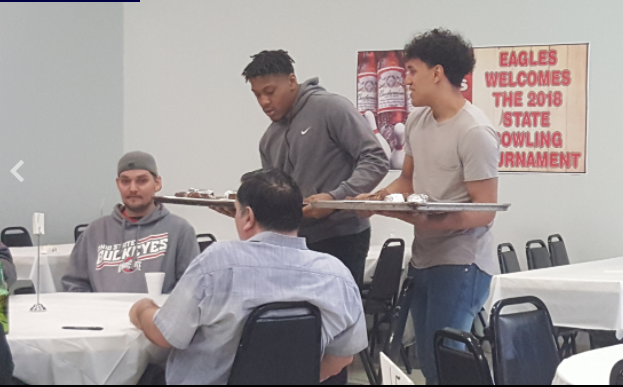 A big thank-you to Coach Dave McFarland and his young men of the Lorain High School football program who were a great help to the LSHOF by serving and cleaning tables at our annual steak fry on Feb. 18! And, of course, a big thanks to all who helped and all who attended the steak fry, which supports our J. Ed Uland Scholarships. 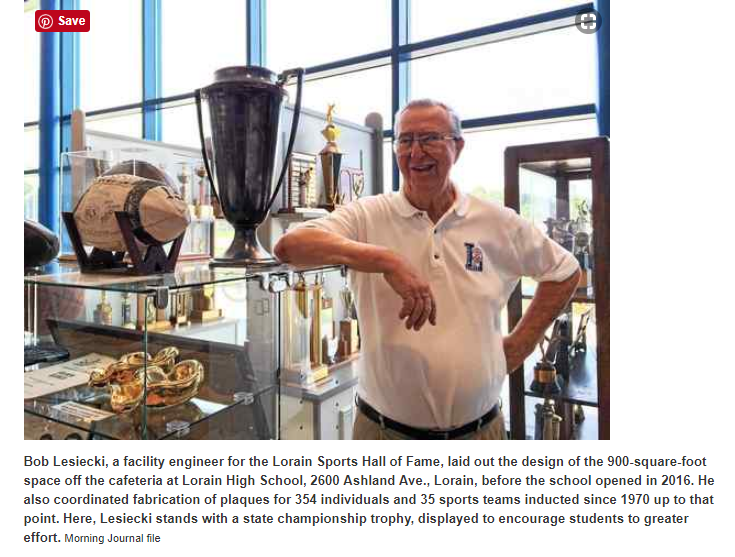 Get your tickets now for the Lorain Sports Hall of Fame’s annual Steak Fry, to be held Sunday, Feb. 18, 2018, in the Amherst Eagles Aerie 1442 at 1161 Milan Ave., Amherst, from 4 p.m. to 7 p.m.
Steak fry profits will benefit the LSHOF J. Ed Uland Scholarship fund. 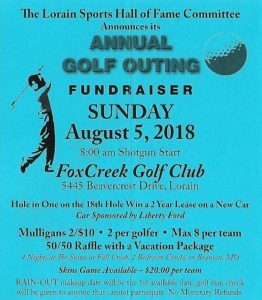 Tickets are $25 each, with $5 of the cost going to a 50/50 raffle. Childrens’ meals can be purchased off the Eagles menu. 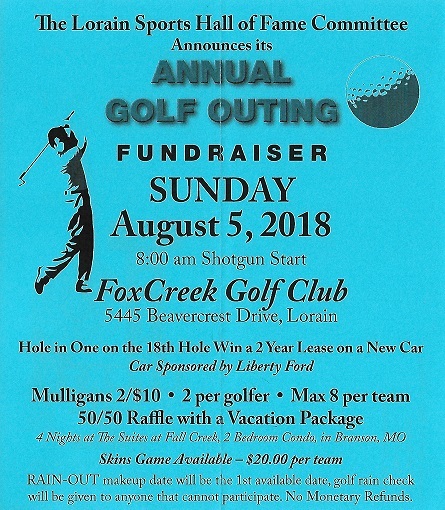 To buy tickets, or for information, please call Bambi Dillon at 440-989-6539.